There is never any shortage of drama in Washington, and yesterday's game in Minnesota had a little bit of everything: a bus crash, a large protest against the team name, and, totally unexpectedly, a little bit of a quarterback controversy between RGIII and Colt McCoy. Adam Schefter reported the belief among some that the decision to start a healthy Griffin came from owner Dan Snyder and GM Bruce Allen, despite McCoy having led the Skins to two straight wins. Then ESPN went further, with a report from Britt McHenry that claimed Griffin has lost much of the locker room. The proof? Players' disruption of Griffin's media session on Friday. When Griffin began addressing the media in the locker room on Friday for the first time since dislocating his left ankle in Week 2, about 15 teammates began shouting. It was so loud and distracting, the franchise quarterback — and reporters — had to leave the locker room so Griffin could speak someplace where he could be heard. That's when the cheering got even more boisterous. A source familiar with the incident told ESPN's Britt McHenry that Griffin has "alienated himself" from the locker room. Griffin looked decent, especially early, but couldn't keep pace with Teddy Bridgewater in the second half as the Vikings snatched a 29-26 win. And afterward, head coach Jay Gruden—in no uncertain terms—took issue with ESPN's story of locker-room tension. "It was an amateurish report. Totally not true. For anybody who reads that, to believe that, they're an amateur. Anybody who reports that is an amateur. It's totally false...[W]e are in D.C., it is Robert Griffin, they're going to try and tear him down and tear us down, for whatever reason. But we're going to stay united as a locker room and that's that. We're not going to let anybody get to us. That's some small-time reporter reporting fiction." Given their track record, the Skins should probably never, ever get the benefit of the doubt when denying internal dysfunction. But this specific report seemingly hinged on that one Friday incident, where Griffin's interview was forced to be moved out of the locker room due to the other players shouting it down. And DC Sports Bog's Dan Steinberg has rounded up witness statements from a number of other reporters who were in that room—regular beat reporters—who say it happened, but not for the reason McHenry inferred. Yet that's a significant number of local reporters all telling the same story, so go against that rare concordance at your own peril. Still, there's something funny about the true explanation for Friday's outburst. We don't hate our quarterback. We just hate our PR staff. Which, to be fair, shouldn't affect the on-field product as much. 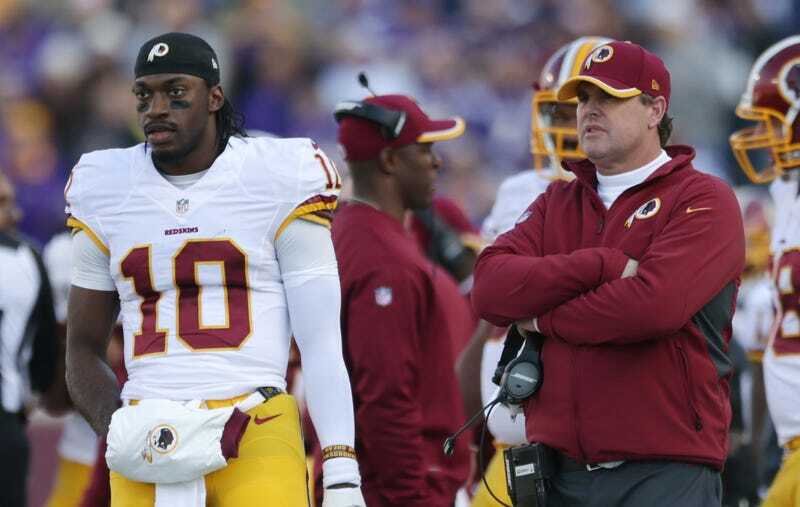 I'd hate to see the Skins' performance if they actually did feel alienated by RGIII.